Last week for FFF, I wrote about my grandparents’ house in Iowa. 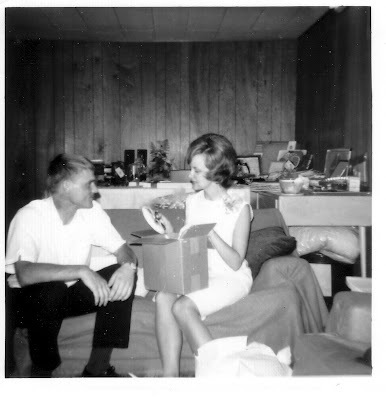 This picture shows my parents opening wedding presents in the basement of my grandparents’ house. They were married in the summer of 1966, and that fall they moved to Houston. My dad had a year of vicarage. Then they moved back to St. Louis for another year at the seminary before he graduated as a full-fledged reverend in 1968. As a kid, I loved looking at my parents’ photo album and seeing how they looked when they were young. I still love those old pictures!